A criminal case can be an extraordinarily upsetting and disorienting experience, particularly for someone who is having their first encounter with the criminal justice system, but also for defendants who have had prior cases. The defense attorney needs to know many things to be able to represent their client effectively. Obviously, counsel needs to know the facts of the case, and will learn them, at least in part, from the discovery provided by the prosecuting authority. Defense counsel also needs to know about their client's personal situation in order to determine whether anything in their background bears upon the case. After all, a defendant is also a human being with a story to tell, and one of the functions of a criminal defense attorney is to make sure that the court and the prosecutor have this information. Many criminal cases are resolved through negotiation, and the law firm of James S. Friedman, LLC, knows that thorough review and preparation of each aspect of a case places a client in the strongest negotiating position. This includes a complete investigation and review of all evidence. However, both the defense attorney and the client need to remember at all times that any criminal matter can go to trial. Accordingly, counsel may use their best efforts to resolve a case without a trial but, at the same time, must prepare for any trial that may be necessary. 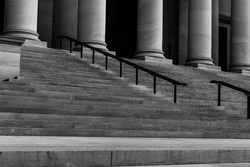 Whether someone is being investigated or has already been charged, skilled representation in court by an experienced criminal jury trial attorney is vital to the successful outcome of any criminal case. From arrest through appeal, the law firm of James S. Friedman, LLC, prepares meticulously to present a client's State or Federal case in the most effective way possible. Obtaining and reviewing evidence, negotiating with prosecutors, and presenting a convincing case at a criminal jury trial is a long and difficult process with many twists and turns. Experience isn't an option — it's a requirement. Gun Permit Applications and Appeals. If you, a family member or friend has been charged with a Federal or State crime in New Jersey or New York City, the selection of the right criminal defense lawyer could make a critical difference in the outcome of the case. Attorney James Friedman aggressively protects all of his client's constitutional rights and seeks the best possible outcome in every matter. To schedule a consultation to discuss an adult or juvenile criminal matter, contact Mr. Friedman online or at 800-361-6554 (toll free).